Coming out of Israel is a new wearable device that can help the visually impaired see. OrCam is a camera and mind-reading computer that can see everything you can see and can tell you what you’re looking at. Simply point at words, products, or people and the camera knows what you mean and will tell you what it is. The camera and bone conduction sound device is mounted onto any pair of eyeglasses and lets those with limited or no sight know what they’re looking at. OrCam is like a Google Glass, but specifically designed for the visually impaired. The small device attaches to any pair of eyeglasses and acts like a personal sight companion. The device will tell you what you’re looking at, reading and who you’re seeing. Hand gestures, like pointing and waving, tell the OrCam what specifically you want to know. Then using bone conduction, it tells you what you’re looking at. OrCam can even read to you from books or newspapers when you simply point at the page and it will begin reading at the top of the passage. The device is great for those who have limited sight, are completely blind and may even help those with dyslexia or dementia. It comes with a wide knowledge of common products and things, and the wearer can easily and quickly teach it new things and especially people’s faces so it can recognize when you see a friend. The device is now available for $2,500 and can attach to your favorite glasses. Coming out of Israel is a new wearable device that can help the visually impaired see. OrCam is a camera and mind-reading computer that can see everything you can see and can tell you what you're looking at. Simply point at words, products, or people and the camera knows what you mean and will tell you what it is. 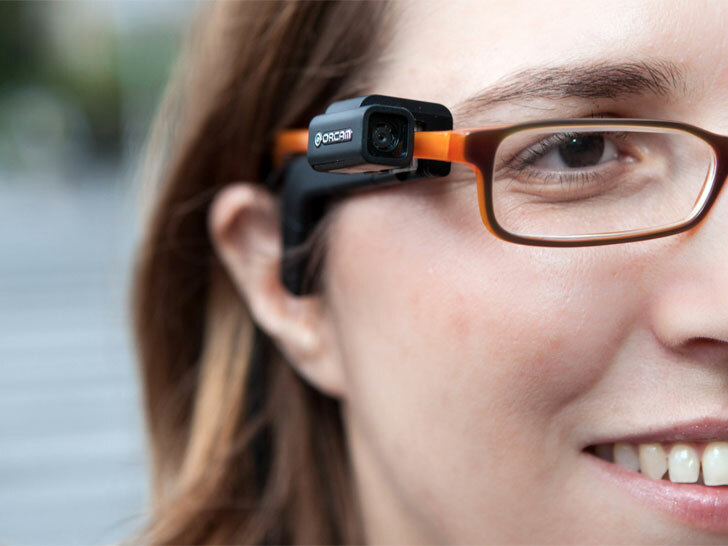 The camera and bone conduction sound device is mounted onto any pair of eyeglasses and lets those with limited or no sight know what they're looking at.